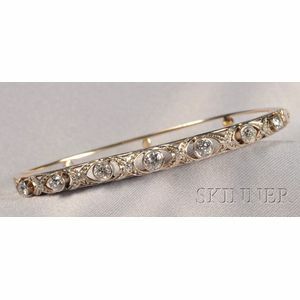 Diamond Bangle, Allsopp & Allsopp, set with old European-cut diamonds, approx. total wt. 1.25 cts., interior cir. 6 5/8 in., maker's mark, 14kt gold and platinum mount, (rhodium plated). Rhodium plating worn through in areas.